This is the second book in the Alex Ripley Mystery series. It provides no spoilers of the first book, so you can read on. But if you’d like to hear my thoughts of the first book, check it out here. 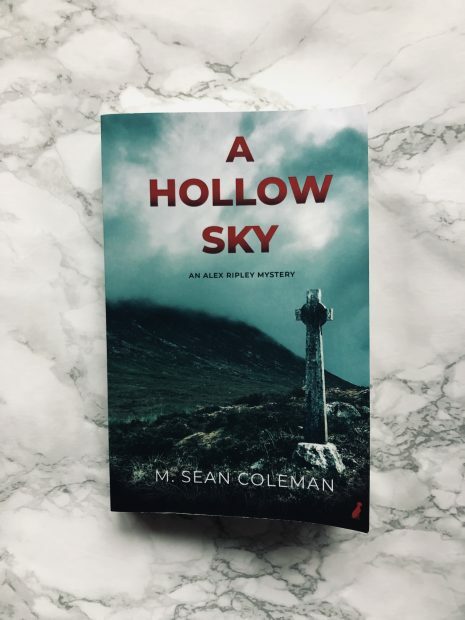 A Hollow Sky by M. Sean Coleman makes a wonderful, chilling addition to the series and after reading this, I can’t wait to see more from the author. Jane Hewitt had been miraculously healed – cured of a terminal cancer that had been eating away at her body for months. After one meeting with an incredible young woman, Jane rose from her wheelchair and walked out, believing that her lifetime of devoted faith had been rewarded. The next day, Jane died in her husband’s arms, devastated that God had deserted her. Her husband, Ian, blames her hastened death on the faith healer. But that faith healer is a teenage girl called Megan, who has been in a coma for five years and has no say over how her gift is used. Ian turns to Dr Alex Ripley to clear his name and to stop the family deceiving any other victims. From my point of view, this really should have been the first book in the series, as it really shows why Ripley does what she does. However, The Cuckoo Wood was slightly better, due to its originality and tense moments. In A Hollow Sky, I really loved the guessing which comes hand-in-hand with a fab mystery. There are some characters which you sorta like, but wouldn’t invite them round to a party, and other characters which are very unlikeable. So up until the climax, you’re still trying to predict what’s going on. Coleman does not disappoint in A Hollow Sky with his writing. Fast-paced and a quick read, with the story building to a good ending. The book gets super tense near the end, so make sure you can read the last 80 pages in one sitting! The author also does a really fantastic job in painting the scene; I felt more thrown into the location and loved the meaning behind the title. I wouldn’t say that A Hollow Sky is really original, as you hear about this sort of stuff happening, but that just adds another dimension of thrills and chills. I’d strongly recommend reading The Cuckoo Wood first, so you have more information about Ripley and a side-plot which is further picked up in A Hollow Sky. However, this book can be read as a stand-alone. A very, very good mystery. I can’t wait to see what other ideas Coleman comes out with, because his ideas have been amazing so far.